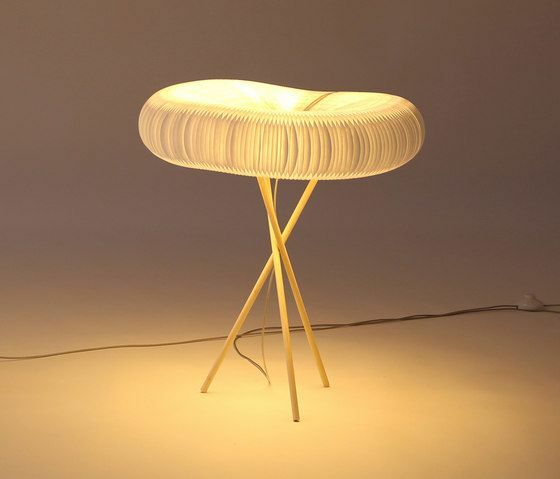 cloud floor softlight + cloud table softlight are the two most recent lighting additions to molo's award winning soft collection. The white textile shade of cloud - comprised of hundreds of cellular honeycomb-like forms - is lit internally by energy-efficient LED and radiates a gentle, all around, ambient quality of light. The beautiful, low glare light emanating from cloud makes it ideal for reading, doing detailed work, or simply bringing a new impression to a space. cloud table softlight stands 585mm (23”) tall upon a visually delicate, three-legged sustainable hemlock base. Perched on the three wooden legs, the airy honeycomb shade shade is the same size/type as molo’s small cloud softlight pendant. The cloud shades are lit by energy-efficient LED with the option of either neutral ‘daylight white’ (4800K) or ‘warm white’ (3300K). cloud softlight shades are made from translucent paper-like, non-woven polyethylene. The textile cloud shade is tear, UV, and water resistant; fire and acoustic rated; and 100% recyclable. cloud floor + table softlights can be combined with suspended molo cloud softlight mobiles and pendants to create cascading cloudscapes and cohesive sculptural environments. softlighting belongs to molo’s innovative and award winning soft collection of expandable/compressible furniture, lighting, and space partitions created from flexible paper and textile honeycomb structures.